Often linked to the Arte Povera movement, Giulio Paolini is best known for an artistic practice that is inscribed in a more strictly conceptual sphere. 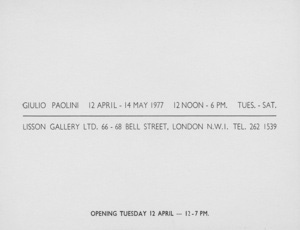 From the outset of his career, Paolini has developed a complex research centred as much on the artist's tools as on the figure of the artist as an operator of language and accomplice of the viewer. The main characteristics of his artistic expression include citation, duplication and fragmentation, which are used as expedients for staging the distance between a finished model for making the work a 'theatre of evocation.' 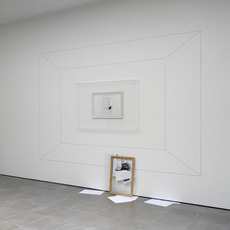 Articulated and composed designs, centred on additive dynamics (ordering, repetition, juxtaposition) and centrifugal forces, (explosions and dispersions starting from the centre) or centripetal ones (concentration, superimposition, joining), accompany the procedures drawing from a vast store of cultural mythologies and memories that are recaptured in photography, collage and plaster casts. More recently, Paolini's incessant investigation of the definition and purpose of the work has been insistently concerned with the act of exhibiting, which he sees as the fundamental moment of encountering the work. Giulio Paolini lives and works in Turin, Italy. Major solo exhibitions include the Fondazione Carriero, Milan, Italy (2018); Center for Italian Modern Art, New York City, NY, USA (2016); Whitechapel Gallery, London, UK (2014); MACRO Museo d’arte contemporanea Roma, Rome, Italy (2013); Accademia di Belle Arti di Brera, Milan, Italy (2010); Museo Archeologico Nazionale di Napoli, Naples, Italy (2009); Kunstmuseum Winthertur, Switzerland (2005); Museo d’arte moderna e contemporanea di Trento e Rovereto, Rovereto, Italy (2004); Museo D’Arte Contemporanea, Castello di Rivoli, Turin, Italy (1999); Galleria Nazionale d’Arte Moderna, Rome, Italy (1988); and The Solomon R. Guggenheim Museum, New York, NY, USA (1985). He has also participated in numerous group exhibitions, including Fondazione Prada, Milan, Italy (2018); State Hermitage Museum, St Petersburg, Russia (2018); Serralves Museum of Contemporary Art, Porto, Portugal (2016); Centre Pompidou, Paris, France (2015); Musée d’Orsay, Paris, France (2013); and The Art Institute of Chicago, Chicago, IL, USA (2012). His work has been included in many editions of the Venice Biennale, Italy (2013, 2011, 1997, 1995, 1993, 1986, 1984, 1980, 1978, 1976, 1970) and 'documenta', Kassel, Germany (1982, 1977, 1972). 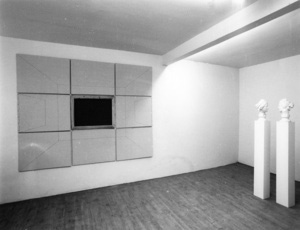 His work features in numerous international public and private collections, including Tate Collection, London, UK; San Francisco Museum of Modern Art, CA, USA; Solomon R. Guggenheim Museum, New York, NY, USA; The Art Institute, Chicago, IL, USA; Stedelijk Museum, Amsterdam, The Netherlands; Nationalgalerie, Berlin, Germany; Galleria nazionale d’arte moderna e contemporanea, Rome, Italy; and Musée d’Art Moderne, Brussels, Belgium. Wooden picture frame painted white, Plexiglas vitrine, untreated wooden picture frame, Plexiglas sheet, graphite on wall 272 x 350 cm / 107 x 137 3/4 in. Plexiglas structure with etched drawing, Plexiglas base and sheets, paper fragments 150 x 90 x 90 cm / 59 x 35 3/8 x 35 3/8 in. Pencil and collage on paper Each framed: 62 x 49.8 cm / 24 3/8 x 19 5/8 in. Mirrored Plexiglas platform, transparent Plexiglas volumes, Plexiglas sheets and fragments, Plexiglas sheet with engraved drawing, crystal sphere, photo enlargement 201 x 256 x 257 cm / 79 1/8 x 100 5/8 x 101 1/4 in. 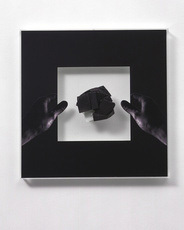 Two Plexiglas plinths, sheet of drawing paper, black pencil 120 x 40 x 40 cm / 47 1/4 x 15 3/4 x 15 3/4 in. Sheets of grey and black paper, collage on glass and wall 420 x 900 cm / 165 3/8 x 354 3/8 in.